People will notice a certain glow about you with your new Too Late Aurora watch. With a comfy, hardy silicone band embedded with a digital mechanism, it can handle all life’s knocks and bumps as well as lots of water activity. 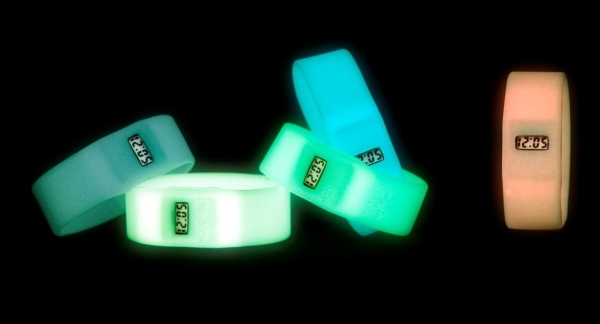 Perhaps the glow in the dark band will help new parents during those long nights feeding baby every few hours. I never liked sitting in the dark, nor did I like wearing a conventional watch because it was hard on my newborn’s head. No such worries with the soft silicone Aurora! We wrote about Too Late’s watches last September. Those and the Aurora watches are available in Australia through Sillycone. All watches come in two sizes. Also be sure to check out the new Remixed series by Tony Ranidro, a street artist. These make awesome gifts for older kids.